A 65-year-old grandmoth­er was in tears yester­day when she thanked Minister for Waterways Ma­hendra Reddy for drainage work being carried at Qele­waqa in Labasa. Gyan Wati said her two years of suffering had come to end because now water from the mountain during heavy rain would not flood her compound. “There were times, some­times for two weeks, where my compound was filled with wa­ter because there was no prop­er drainage system nearby,” Ms Wati said. “For many days I was not able to step out of my house with my only grandson. “Today I am very happy be­cause all my fears and stress has gone. Mr Reddy, while talking to Ms Wati during his tour inspec­tion, asked her what other problems she was facing. She said she needed electricity and he said he would look into it. 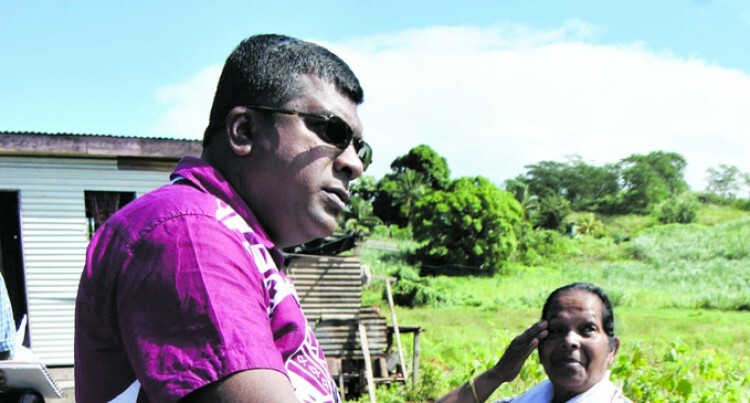 “I have been carrying out in­spection of the greater Labasa area from yesterday,” he said. “There are three areas in La­basa that are frequently sub­jected to flooding such as Sibe­ria, Soasoa and Batinikama. “We have done scoping and some drainage work and some problems have been resolved. “The catchment area is very large and we need to under­stand that the conveyor system of water which has three com­ponents. “The lower downstream has drainage system, which is de­signed to handle storm water not the water coming from wa­terways. “The second is the waterway that links to the upstreams and the third component is the wa­terways that link to drainage system to the water catchment area. “The additional water from upstream and catchment have to be held there and gradually release it to the downstream. “When we have gushing water from the water shed and catch­ment suddenly, the waterways system and drainage system can’t handle it. “The real work for the next three to four years is how we manage our catchment area and watersheds. “We need to understand what is happening here and have de­tailed data and plans which we haven’t done.